Left to right: Knight Bloodline 220-grain sabot load and bullet; Barnes Spit-Fire TMZ 250-grain sabot load and bullet; Hornady SST 250-grain sabot and bullet. Hodgdon Triple Seven Magnum 60-grain pellets, 50-grain equivalent pellets, and 50 grains of loose Triple Seven 3F. Modern technology has done wonders for muzzleloader deer hunting. First, the plastic sabot gave us the option to shoot jacketed, plastic-pointed, and now even the latest copper-monolithic bullets. Then technology took us from side hammers and caps to in-line ignition with 209 shotgun primers and now muzzleloader-specific primers. A couple of pellets in a speed loader replaced the old powder horn. Where .50 muzzleloaders for hunting deer once weighed 8 to 9 pounds, some now weigh a feathery 6 pounds. Most deer hunters shoot .50 muzzleloaders with saboted 250-grain or 300-grain bullets that are actually 44 or 45 caliber in diameter. With modern black-powder substitutes boosting muzzle velocities, these aerodynamic bullets are deadly at well beyond 200 yards. Zero both loads at 125 yards, and the 250-grain bullet has dropped just 18 inches at 225 yards while the 300 has dropped only two inches more, with a similar trajectory curve. Use a laser rangefinder with a quality hunting scope, and that is a very makeable shot (with practice). And, remember, the great majority of hunters will never take a shot at a deer much beyond 125 yards or so, and they usually sight in at 100 yards. For more velocity and a flatter trajectory, you may step up to a three-pellet load. Hornady’s Super Shock Tip bullet is tailored more for rapid expansion than deep penetration, yet they don’t flinch when it comes to suggesting a magnum loading. 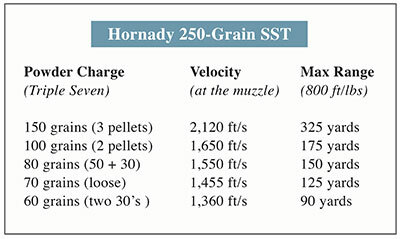 According to the Hornady catalog, the 250-grain SST can be driven to 2,250 ft/s with three 50-grain pellets, and the 300-grainer leaves the muzzle at 2,130 ft/s. Hodgdon actually does not recommend three-pellet 150-grain-equivalent loads with their most-popular Triple Seven (perhaps because of the older, weaker muzzleloaders still out there). Instead, they offer a larger 60-grain Magnum Pellet and recommend two of these (120-grain equivalent) for top velocity. Their website’s data page lists muzzle velocities for popular .50 saboted bullets, of various weights, shot with two of the regular or two of the Magnum pellets. Hodgdon also makes a lighter 30-grain-equivalent pellet. Many loads are possible mixing and matching these three different pellet weights. And don’t forget that there is the option to tailor loads precisely to any charge you like, using “loose” Triple Seven granulated powder. With muzzleloaders, powder is conveniently measured by volume, not weight. A 50-grain “equivalent” pellet actually weighs about 30 grains. Before you load three 50-grain pellets, perhaps thinking you might as well get all the boost you can, first ask yourself if you really need “magnum” power when hunting woodland deer with a muzzleloader. And, perhaps more to the point, do you want that heavy recoil in one of today’s lighter rifles? Powder charge and bullet weight work together to determine velocity and energy at the muzzle; they also determine recoil. While a more aerodynamic bullet shape, alone, may significantly boost downrange performance, we cannot escape the law of physics that dictates that for every action (bullet leaving the muzzle with more energy) there will be an equal and opposite reaction (more recoil). Since most muzzleloaders are more accurate with two 50-grain pellets than with three, you also may be sacrificing accuracy when you up the load. With two pellets providing enough energy to drop a deer cleanly at 225 yards (or more), I’ll opt for accuracy and use a laser rangefinder to determine the slightly higher hold. Most hunters shoot better with a lighter load that doesn’t kick so hard. Whether it be a cartridge gun or a muzzleloader, two opposing schools of thought also ask whether the bullet should expend all of its energy in the game animal, hopefully for a quicker kill, or instead penetrate through and leave a second, wider exit hole that leaks more blood for easier blood trailing. Heavier bullets, by virtue of their lower muzzle velocities, tend to expand a bit less. This, along with their greater mass and momentum, should allow them to penetrate and increase the chance of an exit hole for a heavier blood trail. Bullet design, toughness, shape and construction also matter here. Early one October morning, many moons ago, a buck strolled by me at 40 yards. I centered a 245-grain PowerBelt behind its shoulder and saw the bullet hit right where I aimed. But I found just two drops of blood while trailing that deer across a rocky ridgetop, through 175 yards of brush. I found the deer lying dead, but it took more than an anxious hour. The bullet hadn’t exited, and a glob of fat clogged the entry hole. PowerBelt designs its bullets to be less than full bore so they load more easily. They are very soft (the company says pure lead) and depend on bullet upset to engage the bore’s rifling. PowerBelt also advises that these bullets mushroom a great deal on impact. If a bullet exits, they say it only wastes energy that could have been spent killing the deer. They recommend their Aero Tip over their Hollow Point for more penetration, though it still is a soft lead bullet that may not leave an exit hole. I prefer exit holes and blood trails, especially when hunting big game with a muzzleloader. I also would like to offer another observation, perhaps more opinion than demonstrable fact. The loosest and hence easiest bullets or sabots to load tend to be the least consistently accurate. They also lose maybe 100-150 ft/s in muzzle velocity. However, since hunters may experience difficulty reloading saboted bullets in a fouled bore—especially when trying to keep an eye on a hit deer—there is a place for the “easy load” option. In addition to tighter-fitting saboted bullets that require patient swabbing to load without difficulty, I also carry a couple of PowerBelts (ones I know shoot to about the same place as the tighter sabot load). If I ever need a speedy follow-up shot to prevent a wounded deer getting away, I may slide a PowerBelt down the bore. The chart (above) lists a few loads run over my Oehler chronograph, to give an idea of how light you might load to reduce recoil yet still maintain an effective deer-hunting range. For accuracy, I did this test shooting with Knight Rifle’s 6-pound Ultra-Lite, a very accurate rifle with a stainless steel barrel from Green Mountain. The Kevlar stock is styled like a cartridge rifle, and while that rifle-like appearance may not help the gun shoot smaller groups, the aluminum bedding block and one-piece stock surely do. Speaking of corrosion, I strongly recommend Triple Seven or DuPont White Hots over Pyrodex pellets. 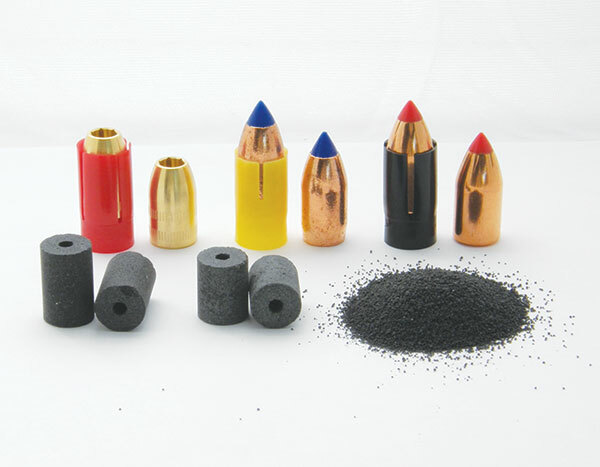 Pyrodex pellets contain a bit of corrosive black powder (the black tip) dating back to when it was thought that this was needed for guaranteed ignition with No. 11 percussion caps. If you shoot Pyrodex pellets, never let a fired rifle sit overnight without a thorough cleaning. Knight promises 4-inch three-shot groups at 200 yards with the Ultra-Lite rifle, using their saboted bullet. I mounted a Leupold 6.5-20X scope, so my old eyesight wouldn’t be an issue, and then exceeded that level of accuracy with four different bullets, all two-pellet loads. I guess Knight qualifies their accuracy promise because there still are projectiles on the market that rarely shoot tight groups with any muzzleloader. Consistent groups of 3 to 4 inches at 200 yards is better than many centerfire deer rifles will do. I got those tight groups shooting Knight Bloodline sabots as well as the Hornady SST and Barnes Spit-Fire TMZ. A modern .50 muzzleloader with a two-pellet load and the right saboted bullet can accurately deliver more than enough punch to hunt deer, especially in the East where shots rarely exceed 200 yards. Consider it the equivalent of a .44 Magnum cartridge rifle. With rangefinder and practiced shooting, both are perfectly effective at 200 yards—maybe even a little more. If you want to reduce recoil, the chart shows how far you may go the other way with lesser loads.